hello again! a rather overdue post for my series of guest bloggers, hope you’ve all been enjoying them so far! 1. if you’re looking for a low maintenance pop of colour then a lip pencil is a great place to start. a personal favourite of mine is the 1000 kisses range by rimmel; they cost no more than £3, contain 1.2g of product and stay put for a good few hours. as with most pencils, black tulip can be a little drying, but all it takes is a dash of lip balm to soften up the texture. lip tip: if the nub of your lip pencil is looking worn and dry, just hold it over a flame for no more than a second. the heat will melt the product just enough to allow smooth application. 2. the kate moss matte range for rimmel has been all the rage since it graced british drugstores in early october. as i’m like a magpie to jewels when it comes to vampy hues, i could not resist picking up 107. tt’s creamy, lasting and utterly pigmented. but ‘107’? really rimmel? they should take a leaf out of revlon’s books – a fantastic colour and a quirky name to boot make for a winning product! (for a truer swatch, click here to see it in daylight). 3. beauty UK is only available online or in store at superdrug (to the best of my knowledge) but if you have access to the range, i urge you to pick up a lipstick. brown sugar was just too unusual a colour to avoid, but i’ve got my eyes set on 6 vampire for a halloween look. Ddspite a strong (slightly unappealing) scent which fades after application, the beauty UK lipsticks are true to their price. for just over £3 you get pigment, moisture and plenty of product, but the lasting power is nothing to write home about. still, a unique range! 4. i was first entranced by make up at the beginning of 2011 after i discovered ELF online; like beauty UK, ELF is a fellow breeding ground for bargains. there was no real rhyme or reason to my choice of voodoo, but it has been a staple lipstick ever since. 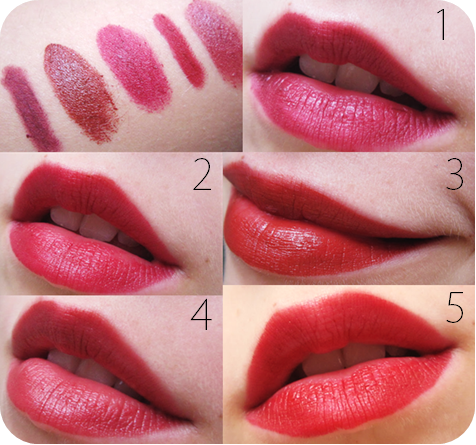 it has raspberry red undertones with a hint of purple and it’s soft and light on the lips. be warned, the swatches ELF provide on their website are extremely inaccurate so it’s best to google beauty blogs for swatches of their full range. 5. i suppose it’s about time i admitted it: i have a phobia of high end makeup. you might be wondering why: the brands are tried and tested, trustworthy and provide quality products which are worshipped by the rich and famous. hell, if i wasn’t so tight pocketed i’d probably be harbouring half of MAC under my bed, but sadly my funds do not match my ambition. nevertheless, on a reason trip to prague i took the opportunity to blow a little holiday cash in sephora. i wanted to invest in something timeless and wearable, so I chose a red velvet matte lip pencil. and boy, is it a true red. it’s actually a little darker than photograph 5 might suggest – truly a cruella worthy colour. i have nothing more to add than some reassurance: if you buy NARS, you’re spending wisely. check out my holiday snaps here. so there we have it – my top five autumnal lip colours for this year. i want to offer endless thanks to helen for giving me the opportunity to guest post: i hope my blog will flourish in same way hers deservedly has. for beauty, fashion, lifestyle, cheap tricks and questionable wit, visit my blog SaraWears. i don’t bite! i am so impressed with sara’s post, thank you so much for doing it! i absolutely adore all of those shades (think no. 2 is my favourite!) and shall be holding you personally responsible for the state of my bank balance. remember to go and check out her blog, it’s really lovely! ps. check out my new ebay items here, i’ve added loads more things! check out my sponsors for this month: the lovely tribal blaze, who stock some beautiful, affordable jewellery. you can get 15% off with the code ‘thelovecatsinc’ / also, barratts shoes, who you can get 20% off with when you use the code ‘extra20’.